We are in a big fat ugly bubble. And we better be awfully careful. And we had a Fed that is doing political things. This Janet Yellen of the Fed, the Fed is doing political by keeping interest rates at this level. One of the commonalities in my experience working on the Council of Economic Advisers staff from 2000-2001, irrespective of the party in charge, is that the Chair, the members, the staff, were scrupulous in not making comments on the appropriateness of Fed policy (R. Glenn Hubbard, quoted above, was my boss during the last half year I was on staff). Hence, I can only imagine the alarm that most observers experience hearing Mr. Trump’s views, contra what reader rtd asserts. Is Fed Policy prima facie too Loose? Like many things Mr. Trump asserts with respect to economics, I wonder about the basis for his views. One possibility is that he is referring to the implications of the Taylor rule (or his advisers are referring to the implications of the Taylor rule). If so, I would say that it’s not so clear the Fed is keeping the Fed funds rate too low. This is shown in Figure 1. 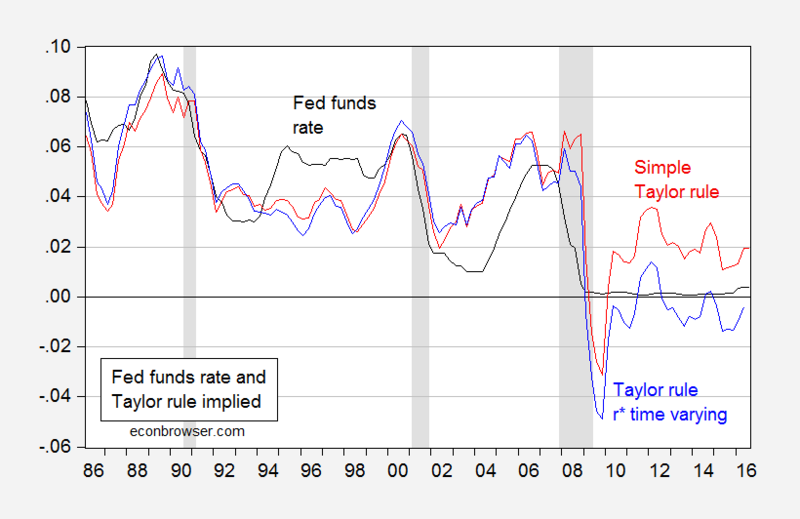 Figure 1: Effective Fed funds rate (black), Fed funds rate implied by a standard Taylor rule (red), and implied by a Taylor rule with time varying natural rate (blue). NBER defined recession dates shaded gray. Source: Federal Reserve, BEA, CBO (August 2016), NBER and author’s calculations. Where ff is the Fed funds rate, π is the year-on-year PCE inflation, y is log GDP, y* is log potential GDP from CBO (August), and r* is constant at 2.5%. This is the same formulation that the St. Louis Fed reported in its Monetary Trends publication (for 2% target inflation). The time varying version uses the Laubach-Williams (one sided) time varying estimate of r*. What is apparent is if one were to believe the real natural rate of interest is 2.5% (so ignoring the entire secular stagnation literature, and other bits of information suggesting the real equilibrium rate is lower), then indeed Fed policy is too loose by the Taylor rule. On the other hand, if one believes the real natural rate has fallen over time to about 0.2 percent (but has risen above the -0.35 percent rate in 2013Q2), then monetary policy as measured by the Fed funds rate is too tight. Update, 10/1, 2:45PM Pacific: I forgot references. Here is the citation for his interpretation. This entry was posted on September 29, 2016 by Menzie Chinn. The Donald is an advocate for Neo-Fisherian monetary policy. He simply has not yet found the vocabulary to express his views. Menzie, Thanks for another shoutout!!!!!! I’m flattered (and concerned) that I continue to be so much a part of your thoughts. As it relates to the former, Trump will have no influence on Congress. Save it on your hard drive. Write it down. Print it. Set an alarm to it. Do whatever it is you do to remind yourself of your reader’s comments. For the latter, this is something we’ve seen Congress easily prevent recently (e.g. Peter Diamond, Allan Landon, Kathryn Dominguez). However, the bigger picture here is that my issue wasn’t at all about the thoughts of Hubbard, et al. The comment wasn’t at all a central point of discussion & wasn’t even a statement i necessarily felt “unequivocally” – it was merely used as context in support of a dig towards you. The bigger issue was, as always, about your sloppy, partisan, and disingenuous commentary as someone who represents academics and particularly economists. And the fact that you can’t understand this (even absent the reality of your extreme difficulty with context) is supported by this very post. It’s all disappointing yet, coming from you, is not at all surprising. On a related note, I was going to ask you about Mishkin’s response to my suggestions for his text. However, I see you are still entertaining the same amateur mistake as many others in the field. rtd: When a reporter asks me about something I haven’t thought about, I usually decline to comment. Menzie, seriously? Any Ph.D., Master’s, or undergrad student of economics has thought about fed independence. Thinking about a subject is vastly different than “pay[ing] much attention to the opinion of” that subject from “a politician such as Trump”. One can still speak to the former and doesn’t prevent speaking to the latter in context. Didn’t we previously cover reading astuteness? rtd: Geez. See 7 min 23 sec in this clip. Seems to suggest he has been thinking about what certain politicans say. At 7:23? I disagree. 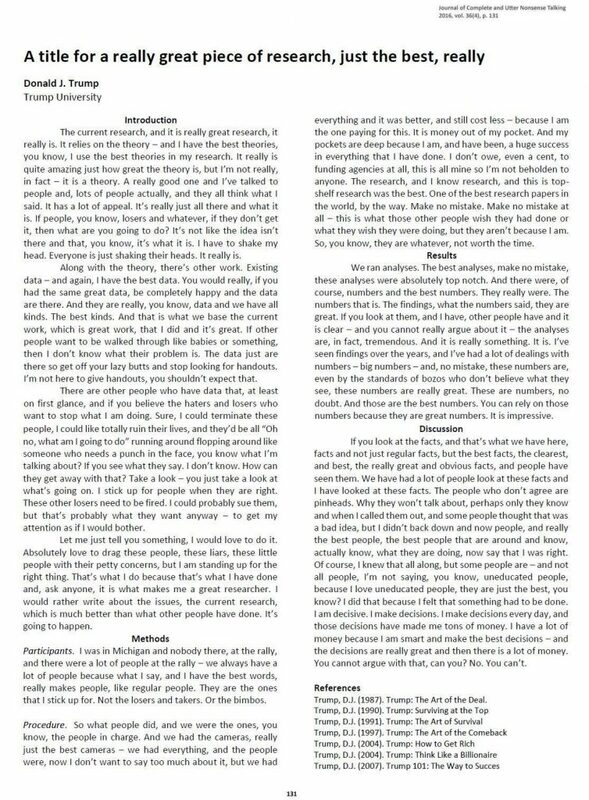 He answered a question with a textbook answer. Aren’t you in concerned by the massive (several percentage points) confidence bands on the Laubach-Williams model? Their original paper had 600-bp bands at 70%, if i recall correctly. You can’t make statements with much precision if you use these estimates. formereconomist: The standard error for the final estimate of r* is 1.7%, so add that to 0.2% to obtain 1.9%, which is still less than than the 2.5% constant value. Just a question from a humble guy who watches numbers and data. Why aren’t the world’s economies doing any better? There should be some questions about Fed policy; not just by Trump, but by everyone.